Since returning to Hong Kong, Chloe So has been promoted to her current position as chemist at Intertek Testing Services Hong Kong Limited. Since graduation, I have worked as an assistant chemist in the commercial laboratory of Intertek Testing Services Hong Kong Limited. I am responsible for hazardous chemical analysis such as bisphenol A in plastic bottles, alkylphenol ethoxylate in textiles, and allergic and carcinogenic dyes on clothing. 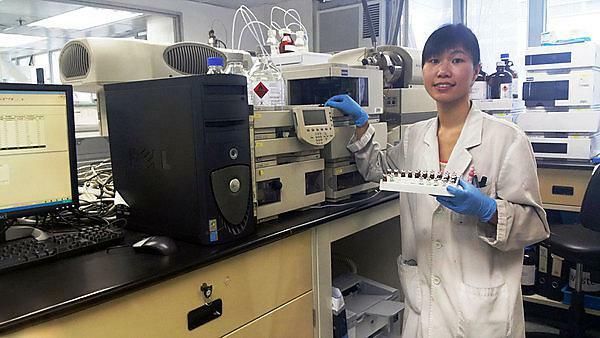 I extract chemicals from samples and I operate some analytical instruments – high performance liquid chromatography (HPLC), especially – to measure the concentration of these chemicals. Also, I prepare lab reports of each experiment. Recently, I have been promoted to chemist. Since being promoted to my current role as a chemist, there have been challenges which I haven’t faced before. My job duties involve not only routine experiment, but also lab management; I have been asked to prepare for audit and accreditation; and I have provided training to junior colleagues. Sometimes instrument don’t function normally, so I need to find out why it does not work and to try and solve the problem (even repair it). Since being promoted, I often now deal with difficulties myself which can make work more stressful. New and funny toys or products are sent for safety testing and qualification before they are introduced into the market. So, I try them first. Sometimes, you are surprised by the content; for instance, I was surprised that a lovely plush bear contained hazardous chemicals. I could even find something which should not be seen by the naked eye. I am proud of myself when the testing I conduct is mentioned in a newspaper. I am responsible for the toy and hardline division, although I am interested in food testing. In recent years, high concentrations of contaminants have been found in foods, such as heavy metal in shellfish, pesticides in vegetables, and plasticisers. This research raises the public’s awareness. I would similarly like to contribute to food safety. Also, I have studied forensic science. I hope to join the government lab and provide neutral scientific opinion on criminal prosecution. You must pay attention to laboratory safety because you will face dangerous and toxic chemicals every day. Preventive measure and personal protective equipment are necessary. Doing something just for convenience’s sake should be avoided. In the end you will be proud of your contribution to science and technology, even though we work under huge risks. There were many experiments other than just theory. The practical experiences consolidated my knowledge. I was more familiar with the analytical instruments. And I did a big research project involving laboratory work for my dissertation. This module equipped me with the skills to stand out in the workplace. The course was very useful for realistic application. Besides I would like to thank my professor and technicians through this medium. Their enthusiasm and kindly assistance achieved my brilliant academic result. Undoubtedly completing the lab reports, giving presentations, and receiving my exam results. However, Plymouth is a green and thriving waterfront city and the peaceful surroundings allowed me to relax. I enjoyed walking around during my down time, having picnics on the Hoe and in Central Park, and visiting the National Marine Aquarium. After the exams were over, our class had a day trip to Cremyll in Cornwall and we had a barbecue there. It was memorable because I made friendships with local students who were strangers at the beginning of September. Yes. Although I returned to Hong Kong after I graduated, I keep in touch with alumni through Facebook, who ‘like’ the photos I post sometimes, and through email. Once, a former lecturer travelled to Hong Kong with his wife and I went with them to have a hotpot at a Chinese restaurant. Also, my project advisor invited me to attend an alumni event at the end of last year. Yes. Plymouth University provided a perfect environment for international students. I was quite nervous before getting on the plane and heading to the UK for my overseas studying journey. However, there was a collection at Heathrow airport, boat trips once we got to Plymouth on orientation day, free English courses, pleasant accommodation, and nice lectures. I was quick to adapt to the new environment. Finally, I graduated with a satisfactory result. The fantastic journey will stay in my mind forever, although I only studied at Plymouth for just the one year. I hope all of you can create your own colourful and unforgettable experiences in Plymouth.